Everyone loves a warm bowl of chili, so why not turn your leftover Thanksgiving turkey to make a big pot of comfort food to enjoy after a morning of Black Friday shopping? Besides the turkey, this white chili features cannellini beans, canned green chiles, cumin, and garlic for a savory delight. 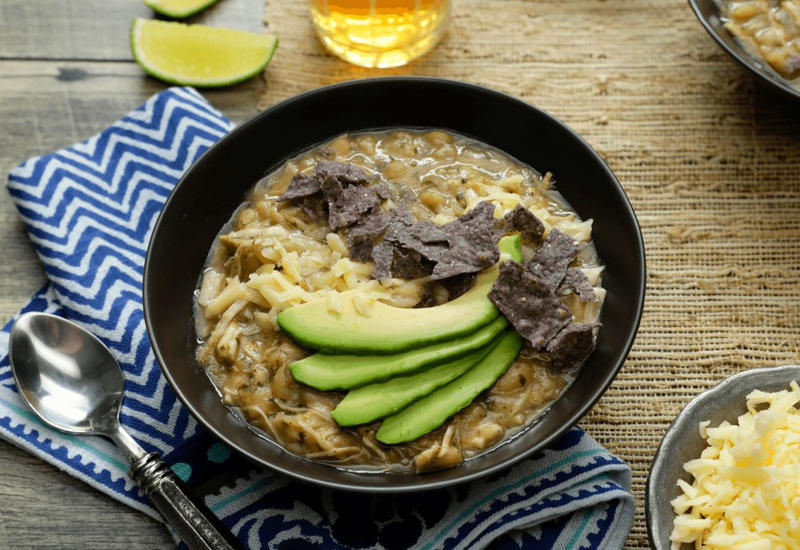 It is topped with sliced avocado, fresh cilantro, white cheddar cheese and blue corn tortilla chips. It is warm, delicious, colorful and fantastically crunchy! Grapeseed oil is a great choice to keep on hand in your pantry. It has a high smoke point which makes it fantastic for sauteing over high heat. Have left over vegetables? Use them us with our easy recipe for Cream of Extra Vegetable Soup! Per Serving: 551 calories; 31g fat; 31.9g carbohydrates; 39g protein; 113mg cholesterol; 1223mg sodium. This was a delicious turkey and white bean chili! It was very flavorful thanks to the chilies, onion, and garlic. It also has that authentic chili taste from the cumin spice. This is the perfect post-Thanksgiving recipe! This turkey and white bean chili is amazing. I had leftover Cajun turkey meat, so that added an extra kick to this dish. I smothered mine in extra cheese, so good! The chiles also give this dish amazing flavor. It's a new fave! This is a five star chili! Reminds me of a dish I would order at my favorite restaurant, but with turkey. Perfect for the day after Thanksgiving. I topped my chili with cilantro, cheese, chips, and sour cream. Delicious! I don't think I had a whole pound of turkey meat leftover, but I made it work. So glad it didn't have to go to waste. I really wanted to make this turkey and white bean chili, but don't have any left over chicken. Instead, I used ground turkey. It was really delicious, glad I tried it!